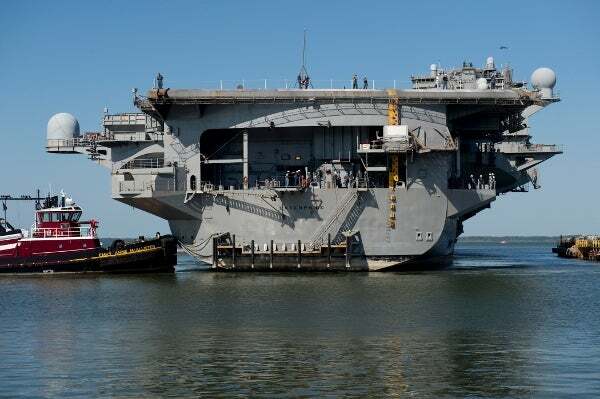 The US Navy has awarded a contract to Huntington Ingalls Industries (HII) for the inactivation of nuclear-powered aircraft carrier USS Enterprise (CVN 65). Under the $745m cost-plus-incentive fee contract, HII will defuel eight reactors of the ship and prepare USS Enterprise for its eventual transit to Puget Sound Naval Shipyard and Intermediate Maintenance Facility. Newport News Shipbuilding (NNS) in-service aircraft carrier programmes vice-president Chris Miner said: "Although Newport News Shipbuilding has defuelled and refuelled many ships, including Enterprise, this is the first inactivation of a nuclear-powered aircraft carrier." NNS-built USS Enterprise was deployed with the US Navy and supported in the Cuban Missile Crisis and operations Enduring Freedom and New Dawn in addition to conducting naval maritime security operations. Launched in September 1960, the 1,123ft-long and 94,781t vessel is expected to be decommissioned after 2015 following the removal of its eight Westinghouse second-generation A2W nuclear reactors. "Although Newport News Shipbuilding has defuelled and refuelled many ships, including Enterprise, this is the first inactivation of a nuclear-powered aircraft carrier." The aircraft carrier is armed with three Mk29 Nato SeaSparrow-guided missile launch systems, three 20mm Phalanx close-in weapon systems (CIWS) and two rolling airframe missile (RAM) systems. Fitted with an SPS-49(v)5 C/D band long-range air search radar, the ship features SPS-64(v)9 I-band navigation radar, SPS-48E 3D C/D band air search radar, Mk23 target acquisition system (TAS) D band system and an SPQ-9B radar with sea-skimmer capabilities. Scheduled to be complete in August 2016, work under the contract will performed at the company’s NNS division, while the Naval Sea System Command will serve as the contracting activity. Image: USS Enterprise conducting mission at sea. Photo: courtesy of Ricky Thompson/Huntington Ingalls Industries, Inc.